In the previous article of the Roleplaying Philosophy series, we defined what a game was and was not. This time we will identify and define the elements that constitute a roleplaying game [RPG]. The execution of this process should result in a suitable definition for what roleplaying games are. A roleplaying game is, as the name states, a type of game. This means that a roleplaying game must meet the requirements of the definition of game. As such, a roleplaying game is a dynamic form of play, structured by rules, where players participate to overcome opposition in order to achieve a goal. However, some theories suggest games must have a victory condition and that RPGs do not meet the criteria for games because of their lack of a victory condition. But, I have already defined game with more relaxed criteria. I also disagree with the criteria that roleplaying games cannot have victory conditions. I think “defeating the big bad evil guy and averting certain doom” qualifies as a victory condition and is a mainstay of roleplaying adventure/campaign tropes. Perhaps a better delineation would be that roleplaying games can have an infinite number of goals while other games have a finite number of goals. I think that another difference is that non-roleplaying games have clearly defined losing conditions. There is the faction that claims RPGs are not games because games are by their nature competitive while roleplaying games are cooperative. I contend that roleplaying games are still competitive even if you are not competing directly against living players. You compete against non-player characters, monsters, traps, and the environment within the virtual world of the game. It is also possible to compete, or struggle against other players in roleplaying games. The exercises of political intrigue and social backstabbing that are prevalent with White Wolf’s Vampire games have shown us that. Some theorists propose that roleplaying games, or roleplaying can never be contained within the boundaries of definition because the genre is too fluid and tends to break any current definition when designers push the envelope on creativity. I think it may be a little pretentious to think that a concept can escape a definitive description. Humanity has been defining the universe since prehistory, and I think given our current knowledge, defining what a roleplaying game is should be within our grasp. Needless to say, much of the controversy surrounding the question of whether roleplaying games exist within the set of games is because of what the proponents of alternate theories believe the definition of a game is. I have provided a fitting definition for game in the previous article; under which, roleplaying games can clearly exist. The crux of the matter when trying to delineate roleplaying games from other forms of games is to define what a role is. Is choosing the yellow token in Clue and naming it Colonel Mustard a role? I am of the opinion that it is not, at least within the limitations implied by the rules of Clue. I propose that a key feature of a role, within the context of an RPG, is the ability for that role to develop. This means that within a roleplaying game there are resources (i.e. stats, equipment, finances, etc.) connected to the role that are dynamic and change over time. A role must also be sentient, something with the capability to make decisions. 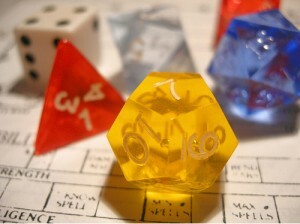 Some theories state that roleplaying games must be described in narrative and are not acted out physically. I dispute this definition because acting should actually allow a player to better assume the role, which is the essence of a roleplaying game. I believe the one of the main motivations behind roleplaying is to explore an alternative reality through the assumption of roles. This can be done through narrative or by physical action. McLimore also proposes that all roleplaying game must have a referee, otherwise known as the gamemaster [GM], to mediate conflicts. I would argue that human moderation is required for a roleplaying game, yet the title of referee could be shared among the players. A game that distributes the role of GM among the players could resolve conflicts by group consensus. The implication of the need for human moderation means that a roleplaying game must have more than one player. Within a roleplaying game a character, controlled by a player, has the freedom to take any action that the character could take if the given situation were real. The player chooses which actions he will take based upon characterization. In other words, the actions are taken because it is what the character would do and the successes of these actions are determined by the limitations of the character as determined by the rules and the virtual environment. This is perhaps why many theories determine that there is a need for a dedicated referee, or GM. Human moderation is indeed required, because there are not any conventional rules that accounts for every action that could be taken or make allowance for all the modifiers to said action. Even if there are “catch all” mechanics designed to resolve any unknowns, human moderation is needed to verify if the action is even plausible. I see Live Action Roleplaying [LARP] games as a subset of roleplaying games. In LARP games, the player physically acts out what his character does, much like an actor in a play, except in LARP it is unscripted. Actions that are beyond the abilities of living humans or actions that could be potentially harmful (such as casting spells, discharging firearms, or swordplay) are often narrated instead of being fully acted out. LARPs still possess all the characteristics of roleplaying games. Table Top roleplaying games are verbally narrated roleplaying games. While facial expressions and hand gestures are common, most if not all of the action takes place in the players’ imaginations. RPGs of this category are also referred to as Pen & Paper roleplaying games to distinguish them from video game RPGs, though neither pen and paper or table tops are actually required for play. Roleplaying games were born from pushing the envelope of the wargaming hobby. As such, wargames share many characteristics of roleplaying games and much of the terminology has carried over. We still use the words campaign and combat round in many systems today. While wargamers take on the roles of generals and commanders during play, wargames are not roleplaying games because they do not contain free improvisation and they have a finite amount of goals (capture objective, eliminate all enemy units, neutralize enemy command, etc.). Even so, it does not take much to turn a wargame into a roleplaying game. Computer roleplaying games [CRPGs], also known as video game RPGs, of the single player variety do not allow for the freedom of improvisation or the true assumption of roles. Therefore, CRPGs are not actually roleplaying games, but games that attempt to simulate the experience. CRPGs use the same settings and mechanics as true roleplaying games but lack the true interaction necessary in the games they simulate. This being said, once a network of additional living players are added to a CRPG, there is potential for true roleplaying. This evident in the text-based multi-user dungeons (MUDs) that still exist today, but were very popular in the mid to late 90s. Massive multiplayer online [MMO] games, the descendents of MUDs, also have the potential for true roleplaying as well, and the interactivity (along with the presentation) of these games is one reason why they are so dominant today. After critically analyzing the elements that comprise a roleplaying game, I am confident to put forth a strong definition of what a roleplaying game is. Just like with my definition of game, I do not claim that my definition is perfect, and a rational discourse could convince me to change it. A roleplaying game is a dynamic form of play, structured by rules with human moderation, where players assume and develop virtual roles of sentience and overcome opposition by freely improvising character actions in order to achieve a possibly infinite number of goals. A less wordy definition that assumes one already knows the Mad Brew definition of Games is: An RPG is a game where players assume and develop virtual roles that freely improvise within the confines of character and human moderation. The next chapter in the Roleplaying Philosophy series will give a brief history of roleplaying games including an overview of the first RPG and how roleplaying has evolved until its current state. Kinsman, B. (2006). System and Theory. Salen, K., & Zimmerman, E. (2003). Rules of Play: Game Design Fundamentals. Cambridge, MA: MIT Press. Walton, J. (Ed.). (2006). Push: New Thinking about Roleplaying, Volume 1. McLimore, G. (1997). What is a Role Playing Game?. Rilstone, A. (1994). Role-Playing Games: An Overview. “RPGs do not meet the criteria for games because of their lack of a victory condition” Hmmm… i might contend that an RPGs victory condition is the satisfaction of a shared imaginative medium or setting. Success comes when players manage to create one, and it persists in this shared context from one session to the next. Failure might be a bit more grey, but we all know some games are worse than others. @Jonathan: I think that what people in that camp mean to say is there isn’t any defined end to the game. I think satisfaction is a very legitimate victory condition, albeit one that does not have a clear delineation of success. Hmm, there are several things, that I’d like to comment, but that’ll have to wait for later, as of now I’ll settle for commenting on the victory condition-thing. It seems to me, that we’re dealing with “victory condition” on two different levels, as Jonathan’s criteria does not necesarily involve defeating any bad guys. If you view roleplaying as a medium, rather than a game the need to “win” disappears. Then it becomes more in line with a other media such as litterature and movies, where the “victory condition” is replaced with having a satisfying experience. I’d say that in order to really define roleplaying, you’d have to get out in the corners and into the fringe. You might want to have a look at some of the Scandinavian Larps, Jeepform, Norwegian Style (http://norwegianstyle.wordpress.com/) or Danish Convention Roleplaying (here is one in English: http://thoughtfulgames.com/montsegur1244/index.html). @Morten Greis: I am unsure if I can view Roleplaying as a medium, especially when put in line with media such as literature and film. Literature and Film are not interactive, deal with passive audiences, and they transmit the same information every time you experience them (though your interpretation may change). I think they are firmly rooted in games because as players, we are constantly striving to reach our goals and there are obstacles put in our paths to overcome. Thus there is a need to “win” our goals. I would still be open to consider roleplay as a medium, but we should not approach it the same method we would analyze a painting, literature, or film. I’d call it both a game and a medium, depending on how you’re willing to approach it. Isn’t Improv technically a medium? That’s getting on for interactive layers, and you know it’s never going to be the same twice. What about collaborative fiction? (Particularly since my favorite means of recruiting people is to describe RPGs as one of the above, With Dice.) Isn’t it cleaner just to differentiate between passive and active media? To be honest, I do take a rather literary approach to my gaming, particularly when working through chat. Don’t we as gamers admire unexpected twists that make a lot more sense when we remember what foreshadowed them? Don’t we try to make sure that our props are visually pleasing, that our characters are memorable, that our descriptions are well-thought-out and (if we have enough time) have literary merit on their own? I’ve learned a lot about the use of feel and themes in games from analyzing literature, and even seen people who’ve used themes-as-big-underlying-philosophical-elements. Granted, we can’t treat them by quite the same standards as things that are by their nature open to revision, but completely scrapping the critique style because of a few minor differences doesn’t strike me as that different from refusing to base movie critique methods on literary critique because the books don’t have moving pictures. @Ravyn: Ok, I had a page of well thought out material to add, but I am going to boil it down. I think that approaching an analysis of roleplaying as art (or a medium, I am thinking these terms are synonomous in this context) using methods intended for more traditional methods is fine at the beginning. But there will no doubt be instances of form unique to roleplaying that do not hold up under traditional critical analysis. Therefore an approach unique to roleplaying that recognizes traditional elements would be in order. Also, objectives and techniques viable in one medium may not translate well in another. We can see an example of this by looking at storyboard art. While many of the techniques employed by storyboard artists are similar to those used by sequential artists, not all the ideologies work for both arts. I think Scott McCloud wrote a whole book on the matter. I recognize roleplaying inherits and shares many elements found in other mediums, especially since roleplaying directly utilizes many forms of art in its production. I have not truly put much thought into the idea of roleplaying as a medium/art, but I think I will be going down that path eventually, though after much reading and research. Much of my reservation for discussing roleplaying in terms of art/medium stems from the issue that art is very speculative and subjective. I want to thank everyone who has commented thus far, it has been awhile since I’ve put this part of my brain through the paces. My preference is to understand roleplaying as a media, rather than as a game, and I doubt that you’ll gain a definition that is less subjective or speculative from your approach, than from viewing roleplaying as a medium. With the approach of viewing roleplaying as a medium, it allows us to borrow theories from studies, that analyses different media, and as the film-medium being so much younger than literature and theatre, and yet been able to generate it’s own theories and analytical tools, so can it be done with roleplaying. So I am not arguing that we should use either literature or film-theory on a 1:1 basis, but I am arguing that we should look to other studies to gain tools. At present roleplaying have been studied from several viewpoints already, from ritual-studies, play-studies and anthropology (examples are in the Knutepunkt books). With roleplaying being so young a medium, we haven’t developed any school of studies yet, which is why the amount of academic studies as of yet are so limited, and thus still in the developing phase. The thing with roleplaying is, that it allows us to tell stories in a manner, that is different from traditional storytelling, from literature, from theatre and from movies, though we can easily see some comparisons. It seems that I’m quite in agreement with Ravyn, and though we at the present have slightly different viewpoints on this, Madbrew, I’m enjoying the discussion, and I’m looking forward to your next instalment. I do hope, that you’ll dedicate one instalment to the media-approach. I haven’t really been able to “get into” roleplaying games, merely because I am much too aware of myself. I’m not trying to seem philosophical, but if I am going to transition into roleplaying games, it would have to be something fantastical. This is also the reason why I don’t play roleplaying games–I know that feeling of transitioning my own reality could potentially become an addition. Ursula Banteux’s last blog post..Black. White. @Ursula: Philosophy is welcome here. Even though I roleplay, I am still very much aware of myself. I don’t think I have ever completely disconnected from reality, and doubt most roleplayers do (the sane ones).